The International Space Station as it is today. This image was taken in July 2009 by departing astronauts on the space shuttle Endeavour after they undocked from the outpost during the STS-127 mission. Thisstory was updated at 5:07 p.m. EDT. Spaceshuttle Discovery is closing in on the International Space Station for a lateSunday rendezvous in orbit around Earth. Discoveryand a crew of sevenastronauts are due to dock at the space station tonight at 9:04 p.m. EDT(0104 Aug. 31 GMT) and boost the outpost?s population to a record-tying 13people. The shuttle is packed with nearly 8 tons of supplies and new sciencegear. ?I?mlooking forward to seeing the station,? Discovery commander Rick Sturckow, whois making his fourth trip to the orbital outpost, told SPACE.com beforelaunching late Friday. ?Every time we?ve been there, it?s gotten a littlebigger.? The InternationalSpace Station is currently home to six astronauts and has a wingspan thatcould cover an American football field. Astronauts have compared its nine mainrooms of living space as comparable in size to the cabin of a jumbo jet. Sturckowwill have a more challenging approach for tonight?s docking because of a small thruster failure in a system used for fine attitude control adjustments.Discovery will rely on its larger, primary reaction control thrusters, whichhave more of a kick and consume more fuel, mission managers said. ?I wouldcharacterize it as slightly more challenging,? said deputy shuttle programmanager LeRoy Cain, adding that when the bigger thrusters fire, astronautscan?t miss it. ?It?s a noticeable, maybe even impressive, event.? 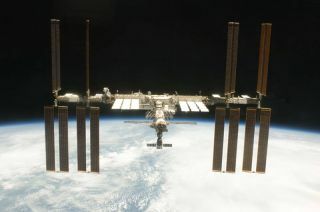 BeforeDiscovery docks at the space station, Sturckow will fly the ship through anorbital back flip to expose the thousands of heat-resistant tiles on itsunderbelly to astronauts inside the orbital laboratory. The station crew willtake high-resolution photographs of the heat shield and send them to analystson Earth for review. The photosurvey is part of a routine shuttle health check to make sure Discovery?s heatshield is in good shape after launch. NASA has kept a close eye on heat shieldintegrity since a hole in the wing of shuttle Columbia led to theloss its seven-astronaut crew in 2003. Discovery?sastronauts inspected the shuttle?s wing edges and nose cap overnight Saturdayas part of their standard shuttle health survey. ?Nothingstood out that I saw,? lead shuttle flight director Tony Ceccacci said earlySunday. Cain said later on Sunday that analysts are still reviewing data from the inspection, as well as video and imagery from Discovery's launch. They are also awaiting the photographs of Discovery's underbelly from tonight's docking, he said. Discovery?ssix-man, one-woman crew will deliver a new crewmember and tonsof science equipment and supplies for the six astronauts currently livingaboard the space station during their mission. Astronaut Nicole Stott is ridingDiscovery to the station to begin a three-month mission to the station. Shewill replace NASA spaceflyer Tim Kopra, who has lived on the station for morethan a month. Theastronauts are also delivering a new space treadmill named after televisioncomedian Stephen Colbert. Colbert wonan online poll to name a new space station room after him, but NASA named itTranquility instead. As a consolation prize, NASA dubbed the treadmill theCombined Operational Load Bearing External Resistance Treadmill, or COLBERT. Thetreadmill launched in pieces packed away in a refrigerator-sized rack inside a cargomodule in Discovery?s payload bay. Stott and her station crewmates won?t set upthe COLBERT treadmill after an unmanned Japanese cargo ship, Japan?s first H-2Transfer Vehicle, arrives at the station in mid-September. Discoverywill arrive at the space station on the 25th anniversary of its maiden launchon Aug. 30, 1984. That mission deployed three satellites and tested solar arraytechnology for future space stations. SPACE.comis providing complete coverage of Discovery's STS-128 mission to theInternational Space Station with Managing Editor Tariq Malik in New York. Click here for shuttle missionupdates and a link to NASA TV. Live docking coverage begins at 6:30 pm ET.